Neither of us had ever been through the Central Valley of California before this trip. If I think about it we probably had vague notions about a lot of the country’s food being grown here, but we had No Concept in terms of what that looked like or what that might mean in practice. 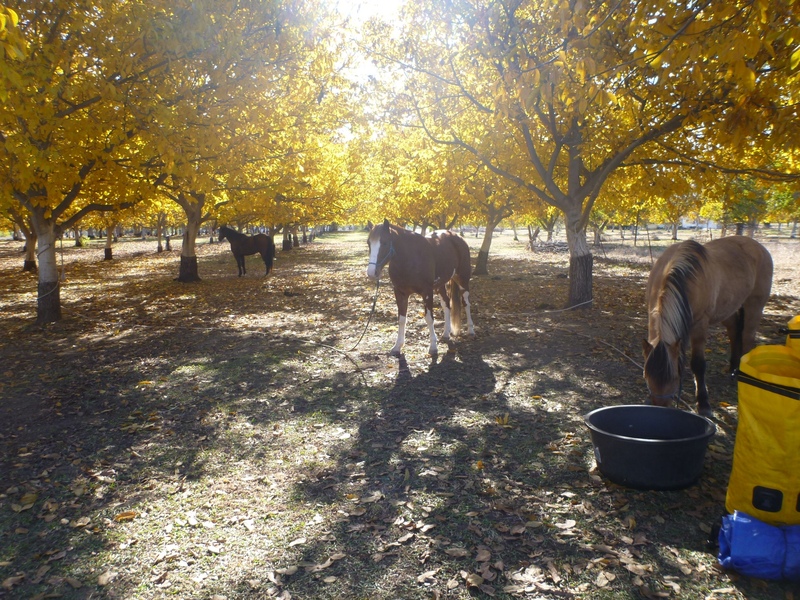 We have been traveling through the valley for three weeks now, starting with a night in a lovely organic walnut orchard where we were given fresh goat’s milk, 4 fresh eggs, the best almonds we’d ever tasted and absolutely elegant walnuts. As we’ve progressed down the valley the concept of organic has grown more and more foreign and impossible. 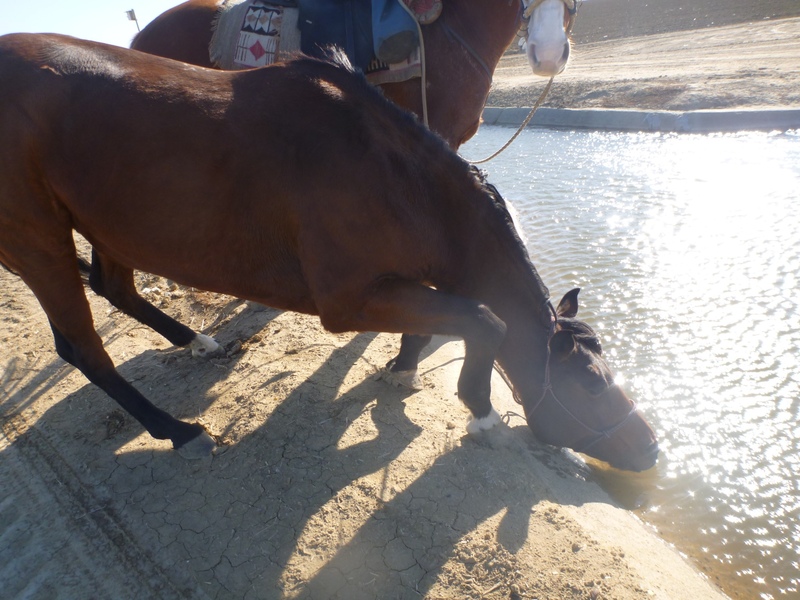 Cowgirl drank from an irrigation ditch and got sick and we’ve been warned not to let the ponies glean the edges of the alfalfa fields because they’ve recently been sprayed with some chemical so that the alfalfa won’t grow at this time of year. 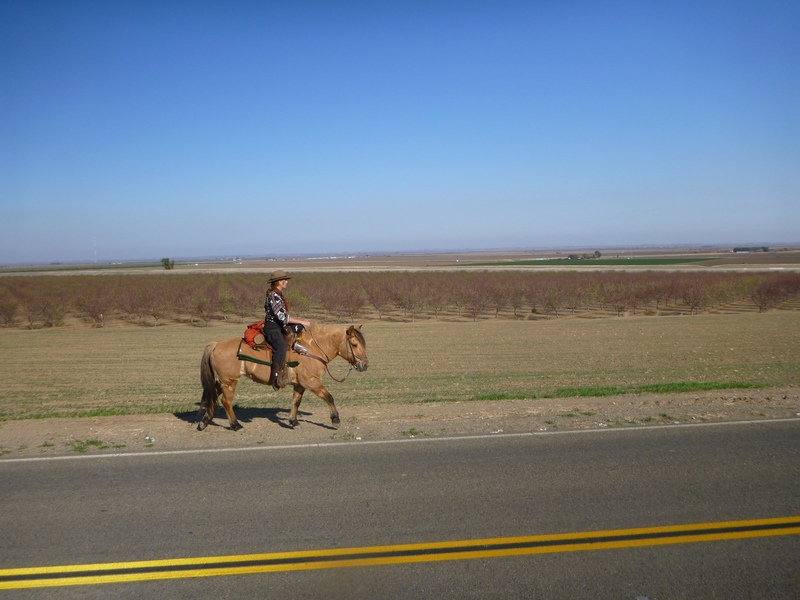 We are riding along the edges of gigantic fields, endlessly repeating rectangles of almond trees and pomegranates, alfalfa and cotton, tilled fields of emptiness and ditches and canals full of non-potable water (even for the ponies). We’re meeting wonderful, kind and helpful people who warn us to be careful because of all the poverty and crime in the area; we ride down the road and meet even more wonderful, kind and helpful people. We’ve been taken in and fed and offered showers, we’ve been given bags of almonds and dried apricots and sandwiches for the road. 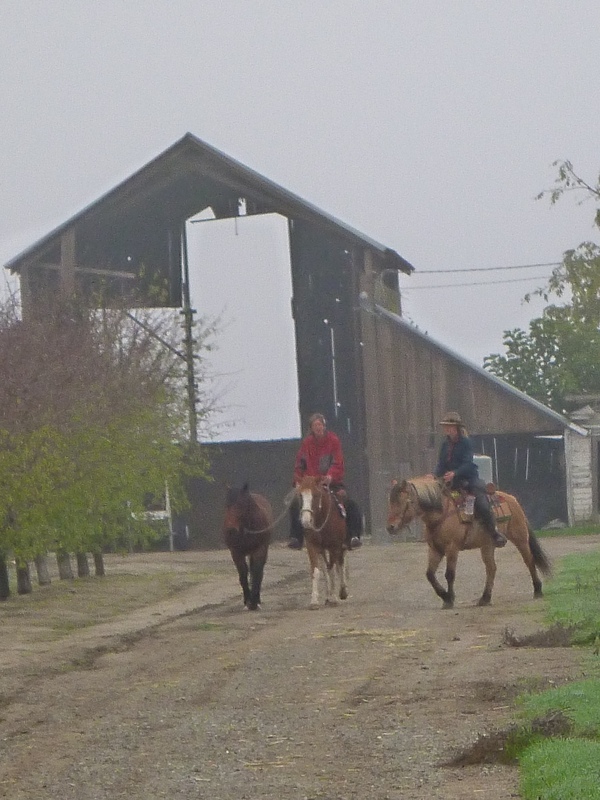 We’ve had help with route planning and getting photos up on the blog and tack adjustments and finding food for the ponies. 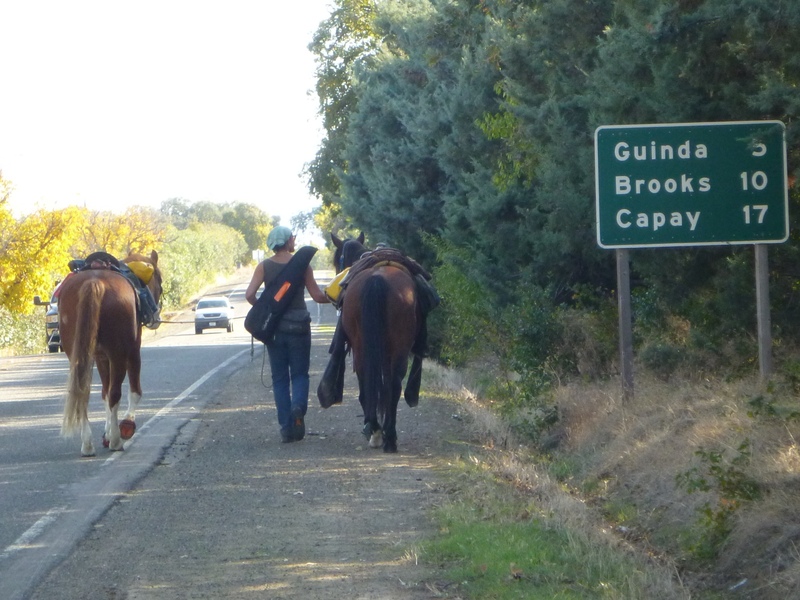 We’ve all 5 been transported past the Bay Area – which seems to be rather impassible on horseback. We have been truly blessed. I know I need to get more specific stories up on the blog, Soon! I’m struggling with issues of naming names and being honest about our experiences on the road balanced against respect for people’s privacy and not wanting to buy into the current trend of dragging out the dirt because that’s what’s “interesting” to people. I read a book this summer about a family who drove a draft horse pulling a caravan around the world. It was a brilliant adventure but the book devolved into an extended thank you note to everyone they stayed with, telling who helped them and specifically how, and was frankly pretty boring to read. I don’t want to make this blog to be about that. I also find myself fearing charges of getting “political” if i touch on certain topics. 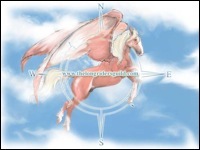 Please bear with us as we find our way with this blog, even as we’re finding our way across the continent with the ponies. 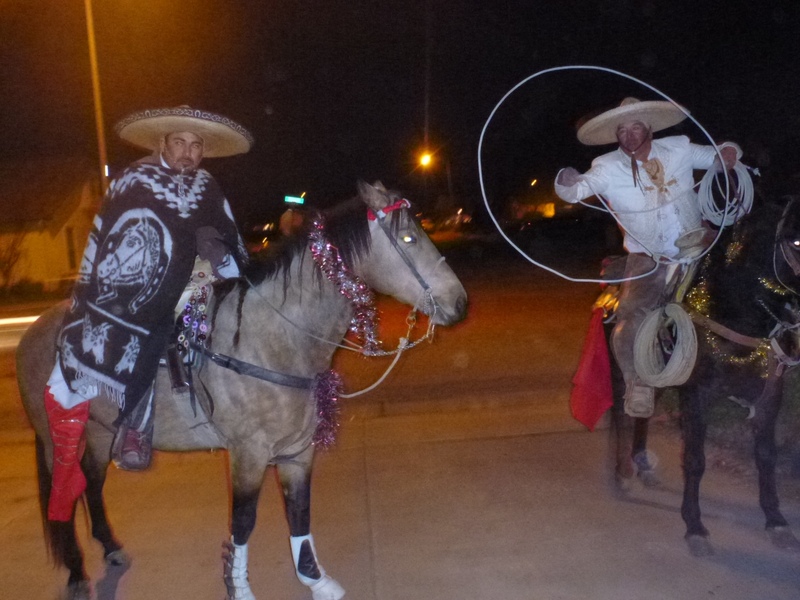 The blogging is taking as much courage as the riding, and it’s obviously an intregal part of the journey. Feedback is welcome (please!) and hopefully the blog will evolve as we evolve and the journey evolves. If things are sometimes out of order, it’s because we’re really behind on posting journal entries from the beginning of the trip until the present, but we do want to share them. When those are posted they’ll be dated and we’ll let you know whose journal they came from. Sometimes photos will be added to already posted entries – so scroll back through once in awhile to check. 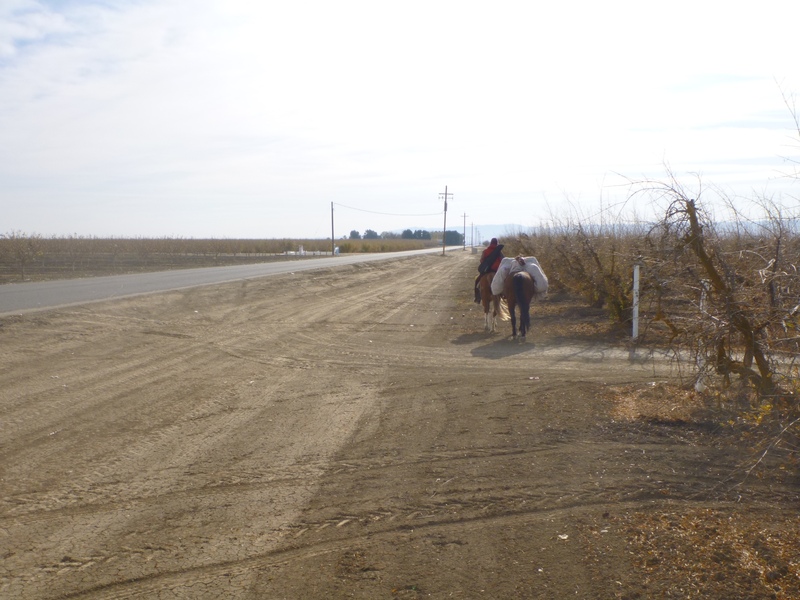 Tonight we’re on the outskirts of San Joaquin, heading towards Helm and Riverdale. 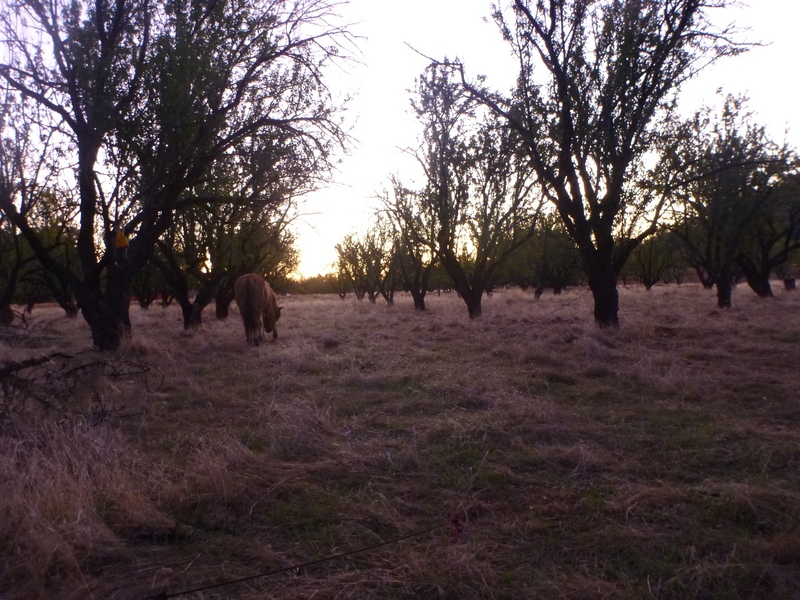 The ponies are out back in a cow pen and we’ve been invited in for the night. As the nighttime temps are down in the mid 20*s (F) we are grateful. Days continue to be glorious in terms of weather, and flat and boring and kind of scary in terms of terrain. 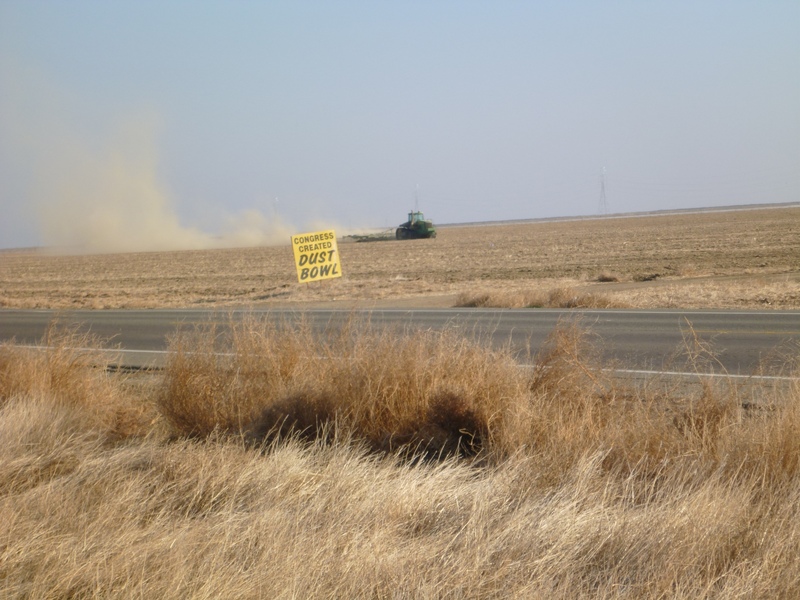 We saw a sign on the edge of a field today “Congress Created Dust Bowls” and a huge tractor out in that field raising a huge cloud of blowing dust. We are riding through a land of profitable non-sustainability. Water is the issue most often discussed – or more accurately the increasing lack of water. We are asking lots of questions and listening to lots of stories and struggling to put together any cohesive picture. 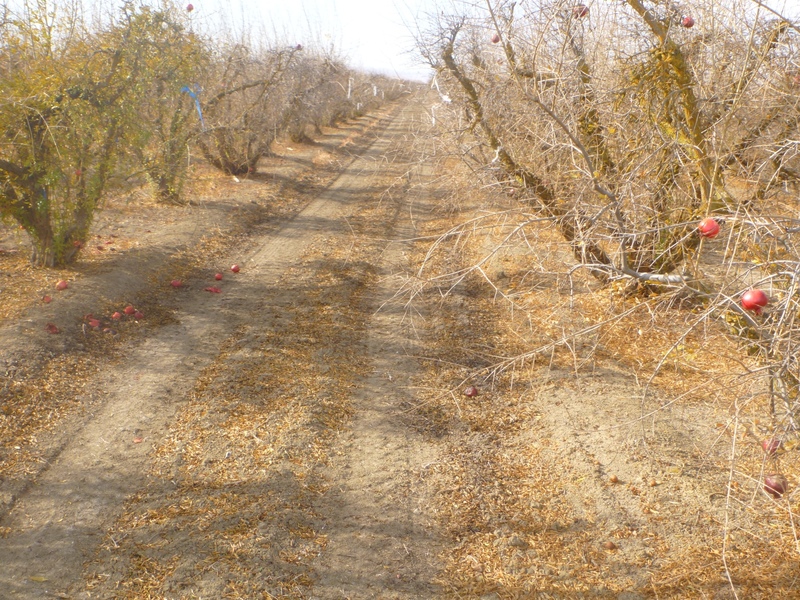 We hope to be out of the Central Valley by Christmas. 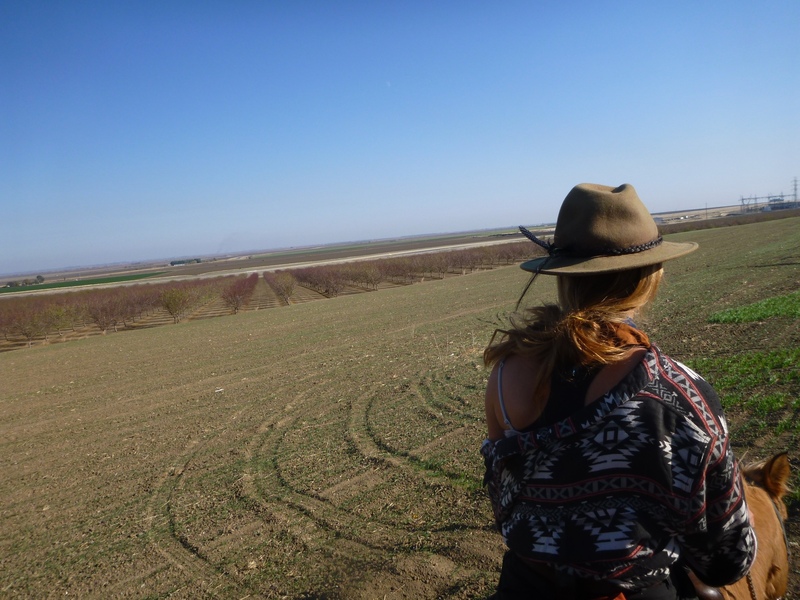 This entry was posted in Uncategorized and tagged almonds, blogging, Central Valley, dust bowl, growing food, horses cross country, irrigation ditch, Journey, monoculture, trail angels. Bookmark the permalink.